Our Partners, Optima CVC, in September 2013, saw the Principal Veterinary Surgeon and her team of volunteers, upon returning from India, as a volunteer for World Wide Veterinary Services and their Mission Rabies Vaccination Campaign, Dr Renee Van Rheede Van Oudtshoorn , inspired by the amazing work, Luke Gamble and his team does, start the journey of combating rabies in South Africa. She immediately contacted Dr Johan Kotze, Chairperson of the South African Rabies Advisory Board, to request information on where in South Africa she can lend a hand in the fight against rabies. Dr Johan Kotze identified Bushbuckridge, Mpumalanga, as an area desperately needing help. With the primary sponsor Welttierschutzgesellschafte.V. and with the help of Southern African Wild Life Training College, Kendon Medical Supplies, Merial Pharmaceuticals, Zoetis, F10 Animal Health, Adcock Ingram, Purina, Pick n Pay, Diag Import and Export , Optima Feeds and Vet Shops, Marltons Pet Products and the already active Optima Community Veterinary Cinic of Dr Reneee, the dream started taking shape. Dr Renee Van Rheede Van Oudtshoorn, Principal Vet of Optima Community Veterinary Clinic, a South African Veterinary Association Community Veterinary Clinic NGO, approached friend and colleague, Dr Dagmar Mayer, to share in this awesome journey in South Africa. Dr Renee Van Rheede Van Oudtshoorn has been involved in intensive community veterinary work in impoverished areas in South Africa since 2007. Her passion is improvement of animal welfare, by educating and uplifting human lives. Her passion for rabies elimination stemmed from her daily work in South African townships, realising the real threat to the communities she became to be loved and respected in over the 7 year period. Volunteers were recruited, the State Veterinary Service was mobilised and University of Pretoria, Veterinary Faculty, Onderstepoort (where Dr Renee Van Rheede Van Oudtshoorn is an annual guest lecturer, sharing her vast knowledge in community veterinary service with the future South African Vets) requested the project to be part of their third year Veterinary Professional Life Curriculum. 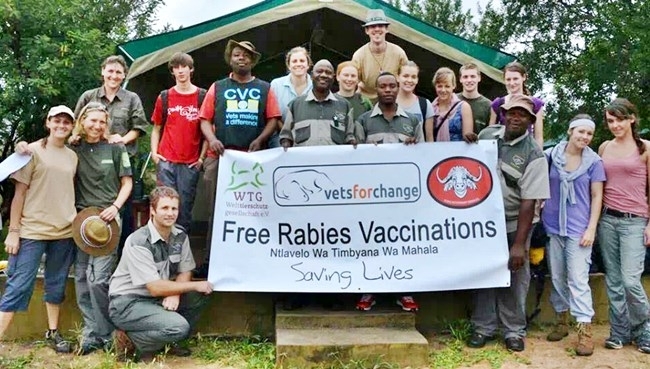 International and local vets, vet students, nurses and lay persons joined with passion and dedication taking on duties from tent pitching (sponsored by the South African Defence Force) to cooking, driving and vaccinating animals, all with the same goal - eliminating rabies in South African communities. During our time working in Onverwacht we realised that a lady by the name of Anna was trying to start a crèche but she did not have the resources. So we started organising and got Premier Diamond Mine in Cullinan on board. They provided all the required materials and skilled labour while EcoLife Expeditions supplied the students who did all the unskilled labour.